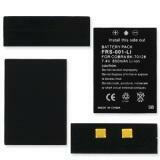 Home > FRS batteries > FRS-001-LI : 7.4 volt 850mAh rechargeable Li-ION battery for COBRA FRS radios. FRS-001-Li : 7.4volt 850mAh rechargeable Li-Ion battery. Fits COBRA FRS. Note: Picture shows various angles of battery. Pricing is for 1 battery pack. This is a special order item. Ships in 4-5 days. Fits the following radio model #s: COBRA CXR-700, CXR-750, CXR-800, CXR-825, CXR-850, LI-3900, LI-3950, LI-4900, LI-5600, LI-6000, LI-6050, LI-6500, LI-6700.